You will see that there are some basic guidelines, and a few very important “rules” that we ask you to follow. 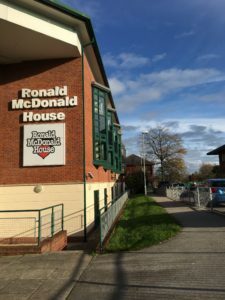 Mac House is a very warm, welcoming and relaxed place to be, and we appreciate that this may of course be a difficult time for you and your family. Mac House isn’t a hotel, it’s your home while you stay with us. We are a home away from home and a family orientated place where you can stay close to your child whilst they are in hospital, but also take some time for yourself, rest and be secure in the knowledge that the phone in your room links directly to the ward where your child is being treated, and you are only minutes away from their bedside. Families support each other here, and our small but amazing team of staff and volunteers will do all we can to make your stay as easy and comfortable as possible.